My family loves beans. Three times a day my husband eats some type of beans as part of his meals. He is great about eating an array of beans every week and has lost over 30 pounds due to his good eating habits. My son and I try to eat beans at lunch every day, he loves black beans with feta and could eat them every day if given the chance. Since we live in West Virginia we also eat a ton of pinto beans, we love them. Given that beans are such a large part of our weekly diet I try to come up with new recipes and bean dishes so we don't get bored. Last week I tried a new recipe from the April/May 2013 issue of Taste of Home magazine for Sweet and Hot Baked Beans. This recipe has 12 ingredients. It takes 5 hours and 20 minutes of total time, 20 minutes of which is active and makes 12 servings. I didn't make too many changes to the original recipe. For the beans I used cannellini beans since they were the type available. I allowed the beans to cook for 6 hours on low and used sweet onions for the onions called for in the recipe. These beans turned out really well. They were a nice combination of sweet and spicy and made enough for three separate meals for my family of 4. My husband and I enjoyed the recipe the most since the spice from the jalapenos was a little more geared towards adults. However, my youngest decided to eat the beans over rice the next day and loved them. The only complaint I heard in my house was that my husband would have preferred if the onions were sauteed and caramelized before being added to the crock-pot. 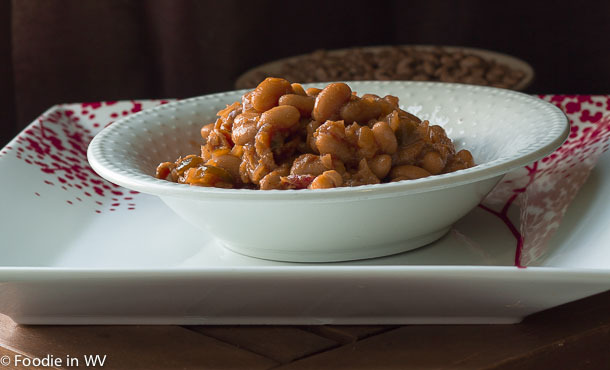 For the recipe go to Sweet and Hot Baked Beans. I like the combo of sweet and spicy! It would go great with BBQ, I agree! They sound delicious. I pinned this recipe! Thanks! I love baked beans, these look great! I love them too, they are yummy! Sounds YUMMY. We are big, make that HUGE baked bean fans in our house! I am gonna pick up the things I do not have and make these this weed-end. Thanks for the recipe. The jalapeno is pretty mild :) The beans are yummy! Great posts, makes me want to try these tonight. Thanks :) The recipe makes a lot of leftovers too, which is always nice! Sweet and spicy is a great mix! You come up with some great recipes on your blog! Thanks for the sweet comment :) I agree that sweet and spicy work great together! I love bean, black are my favorite, I don't think I could eat them as many times as your husband does! This recipe sounds so good and it is a great photo! Thanks for hosting :) I don't think I could eat beans as many times as him either!